Taking a break from her popular, brilliant, Fullmetal Alchemist; Arakawa-sensei drew up a one-chapter humorous Shounen story about a Frankenstein tournament, for mangazine GX to commerate their 5th year anniversary. Of all the one-shots by Arakawa Hiromu, Raiden 18 is the one that meets my desire for oddness, wierdness and humour the most. The big irony here though, is that there are echoes of one of her more famous manga within the pages of this one-shot (yes, it is a one-shot even though it says it has two chapters). Raiden 18 tells the story of the titular character known only as Raiden 18. He is a "Frankenstein" type creature created by the notorious Professor Tachibana Tokoha from "only the highest quality body parts" (which Raiden 18 doubts until he checks the quality of his "parts"). Unfortunately for Tachibana, Raiden 18 considers what has been done to him as both immoral and illegal, until he finds out that Tachibana has done a few other "modifications" to his body parts. Now, this may sound like a fairly greusome scenario, but in actuality it's one of the funniest manga involving dead people I've come across. The first chapter is kind of a cross between Mary Shelley's Frankenstein and Robot Wars, only wierder and more humourous. There's a constant undercurrent of humour running throughout the whole manga, and some of the gags are extremely well researched and delivered (the note on Stalin's coffin in chapter 2 for example). The plot is nice and straightforward (which is exactly what I want in a comedy manga), and doesn't really let up the pace from start to finish. The second chapter is distinctly different to the first, however it is just as funny. It's this kind of inventive and original "lateral" thinking that has separated Arakawa from many other mangaka, and made her one of the most popular mangaka around at this time. This manga, and her other works like Full Metal Alchemist, are great examples of her ability to add to an established concept before turning it on it's head. The manga is drawn very well overall. The panels have a distinctive "cartoon" qaulity to them due to Arakawa's use of bold lines, and much of the detail is extremely simple and clean. The characters are pretty much what one would expect as well. 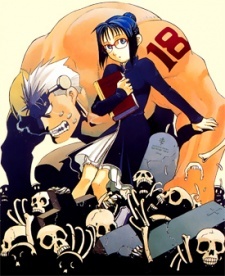 Raiden 18 is a hulking brute of a creature, whilst Professor Tachibana is a bespectacled oddball in a black dress and high heels. The other "beings" in the manga range from the wierd and wacky, to and old man (with wife in tow), who wants a new grave but can't afford one because they're all so expensive, and that's just the Frankenstein's monsters. All of the bit-part and sub characters are individually drawn, and all are as different as chalk and cheese. As for the characters themselves, I love the combative, quasi parent-child/master-slave relationship between Raiden 18 and his creator, Professer Tachibana. Even though she created him (and given him quality "parts" for which he has some respect for her), Raiden does not trust her completely, especially as she seems to be a freak obsessed with dead bodies. Aside from these two though, there are no other real characters (barring Tachibana's father in chapter 2). Now, some people will obviously complain about the fact that there's almost no character development in the manga. My question is, why does it need any? The whole point of the story is to make you laugh at it's absurdity, it's oddness, and the antics of it's characters. Character development, while being a nice thing to have in a story, just isn't needed in some cases - most of those being comedy. I really do like this manga. It has a sense of style and comedic purpose that is rare to see, especially when it's done well. Most comedy tends to be formulaic as the more absurd the humour, the more difficult it is to create or envisage. This is why the truly absurd comedies that are actuially good are always few and far between, so finding a one really is like finding a gem. If you're a fan of oddness, absurdity, and things that take the mickey out of normality, then this may be just the thing you're looking for. Likewise if you want something lighthearted, funny, and nicely anarchic, then you should definitely give this a try. Oh, and for those of you who think that a one-shot should only have one chapter, the second chapter is more of an omake than a full story, so no arguments please.